Levitan Isaac Ilyich painted the famous painting “Wooded Coast” in 1892 in the landscape genre. The picture is painted on canvas in oil, in the style of realism. The plot reflects the beauty of native nature, love and respect for her. Looking at the endless water surface, I want to think about life, being and all that surrounds us, plunge into the atmosphere of kindness and tranquility. There is no evil and falsehood that often surround us. A wide river, winding, goes beyond the horizon. Twilight is coming. The river is quiet and calm, even the forest froze in anticipation, nature is “not moving” and, at the same time, it is alive, and everything seems to go on as usual. In the plot used two extremes. One is a steep bank, and the other is a quiet, peaceful beach. Opposites completely complement each other and create a single composition. Dried stumps give the plot a special flavor, which each interprets in its own way. Levitan master of his craft, he thought through the plot to the smallest detail, showing the nature of the multi-faceted. The water is dark, with a unique greenish tint, glitters in the rays of the setting sun, the sky is covered with clouds, the impenetrable forest is stationary, the coast is sliding more and more. The paints are used in warm colors, which gives the plot warmth, kindness and serenity. Yellow paints convey the feeling that the coast is really showered. That is what talent and skill of a great artist means. Heat comes from the Russian land, which warms not only the body, but also the soul. The artist makes the viewer think about the meaning of life, about love for his native land, about eternity, through the landscape. The picture is in the Tver Art Gallery and is included in the cycle of paintings, landscapes of the great masters of their craft. 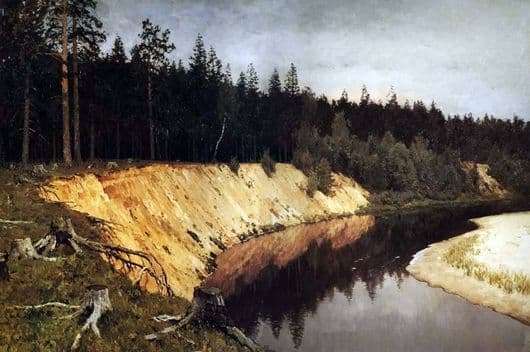 Repeatedly, the picture was exhibited in the famous Tretyakov Gallery, allowing a large number of visitors to see the purity and beauty of the native nature.